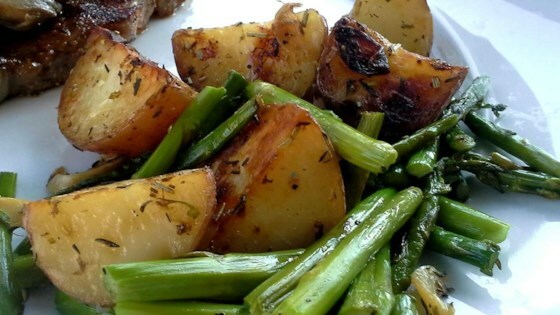 "This garlicky red potato and asparagus dish is easy and delicious served either hot or cold. Rosemary and thyme give it a sophisticated flavor. Try adding a little chopped red pepper, too...yum!" In a large baking dish, toss the red potatoes with 1/2 the olive oil, garlic, rosemary, thyme, and 1/2 the kosher salt. Cover with aluminum foil. Bake 20 minutes in the preheated oven. Mix in the asparagus, remaining olive oil, and remaining salt. Cover, and continue cooking 15 minutes, or until the potatoes are tender. Increase oven temperature to 450 degrees F (230 degrees C). Remove foil, and continue cooking 5 to 10 minutes, until potatoes are lightly browned. Season with pepper to serve. these are very tasty! make sure to not add the asparagus until the last 5-10 mins, otherwise it will definitely be overdone. i also sometimes add peppers, onions, or whatever veggies you like!